BitTorrent is undoubtedly one of the most popular way to download any kind of media online these days. From recent movies, games and shows to software and more exotic stuff like rare anime or ebooks, almost anything is available. But if you’re reading this article chances are you don’t exactly know how to use them. Maybe you’ve read about sites like The Pirate Bay or software like uTorrent and don’t really know what to make of all that? In this guide we’ll get you started in just a few, easy steps. All the basics are covered in this article, and everything important will be taught on the way. In some cases you might want to check our more detailed articles about certain topics, but it isn’t necessary. – Torrents give you access to a bunch of movies, games, music and all other content you can imagine, although old files are often difficult to download. Speed can be anything from slow to rather fast. – To find files, you go to an indexing site such as The Pirate Bay or Kickass Torrents. Then, you download a torrent file or click on a magnet link, causing your torrent client to fire up and start the download. – Remember your identity is not protected, so seriously consider to hide your identity! First, a little piece of software has to be installed to your computer, the so-called client. This is the program needed for downloading, and there are a few to be choosen from. Our preferred clients for both Windows and Mac are uTorrent or Torch. Most people use uTorrent simply because it is the most popular one, and nothing bad is to say about it: You can get it for free at www.utorrent.com, it takes just a few moments. Torch is a browser with a few very handy add-ons: It can download torrents as well as YouTube videos, movies from streaming sites and several other things too. If you like convenience and an all-in-one solution, Torch is the client for you. On the down side it might show a few ads while surfing, and you’ll have to switch browsers. Lightweight, fast, very easy to use: You can't go wrong with it. This classic is currently the most popular client in the network with nearly 50% market share. Step 1: Run the installer and follow the instructions. Step 2: For the best settings, open the Setup Guide by clicking “Options”, then “Setup Guide”. Select a server near your location, run the test and wait a few moments for the process to finish. Then, hit “Save & Close”. A good solution for those who like to have everything in one place. 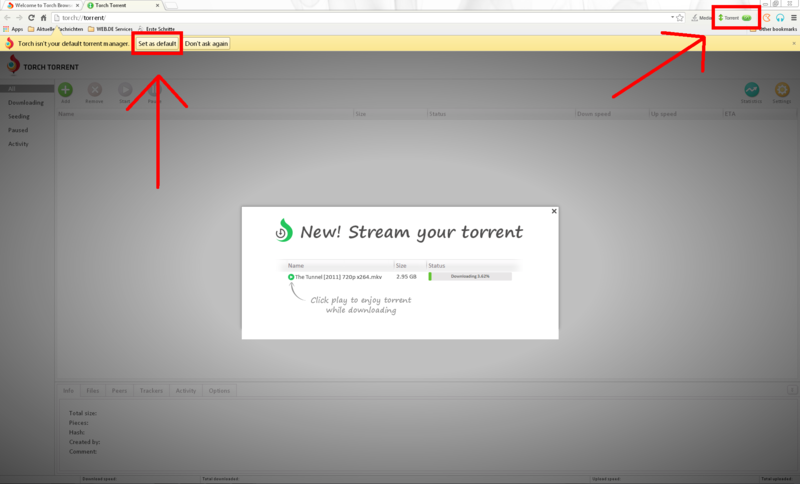 Step 2: In Torch, switch the torrent module on the upper part of the window from “off” to “on”, and click “Set as default” (see screenshot below). Now that you have your BitTorrent client installed and all ready to use, it’s time to learn how to find the stuff you’re looking for. For this, you’ll need a torrent site. Dozens of these are available, and you might want to consult our ranking of the best sites around, but for your first download just use The Pirate Bay, a kinda legendary portal which has almost everything. Currently they’re available under thepiratebay.se, although this address often changes. If you can’t open the website, your Internet is likely restricted. Scroll down to step 4 for solutions. So let’s go there right now. In the search box, enter the name of what you want and select the type of content. In this example, it’s “Steal This Movie” and because it is a movie, we select “Video” (d’oh!). Off we go, next we see a list of results. Locate one that sounds good to you, and take note of two values being shown: The file size and the amount of seeds and peers. Depending on the version you select, results might vary in size quite a bit. Especially with video, generally better quality also means more data to load, which of course might require more patience on your side, especially if your connection is slow. Even more important for your downloading speed is the amount of seeds and peers, being the number of other people currently sharing the file. 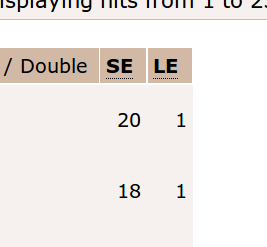 Just select a torrent that isn’t nearly dead, having almost no seeds or peers at all, or having a very bad ratio of users offering the file (seeds) to guys like you who are trying to get it. If not, it might take some while until you’re finished. On this page we see a few more details as well as comments from others. Seems fine, so how to get the movie? We either need a .torrent file or a magnet link, whatever is available; both work the same way, it fires up your client and tells it what you want. Go straight for the “Get This Torrent” link: Baaaam! Your torrent client should kick in and ask you for the select a folder. One more click and the download starts! Be sure to only get files you’re allowed to, otherwise you might and most likely will get into trouble. In case you want to download encrypted and anonymously, skip the next part and go to step 4 instead. Now, the choice is yours: Which place on your hard disk do you want to use? Some people use the desktop, but it is really up to you, anything goes. Anyway, once your done taking this hard choice, hit the OK button and off you go. Wait for a while, it might take one or two minutes before seeing any progress, but generally it’s a matter of a few seconds. 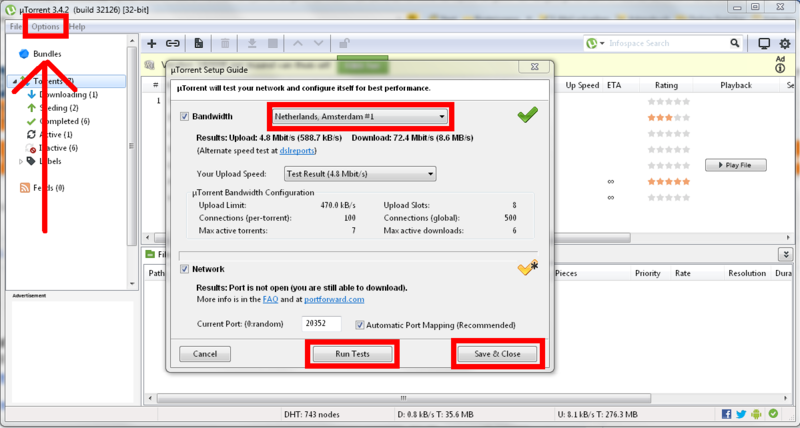 If your download is very slow, read our guide on how to get better speed. Once your done, you can either let the torrent seed some more or remove it from the list. Choice is yours, but you should let it sit there for at least a few hours if you don’t want to be a leech. Sharing is caring after all, and you won’t even notice it. Not to mention all the website blockades all around the world, stopping you from accessing the big torrent sites. In the UK for example, access to The Pirate Bay and Kickass.to has been blocked, and you need to use a public proxy or something to get access. Fortunately, there is a very easy solution to all these issues: A VPN. To put it simple, a VPN service will encrypt all your traffic and tunnel it through secure servers, giving you a new, anonymous IP, and therefore hide your identity online. Since your provider or network administrator can’t scan your traffic anymore, all restrictions you might be subjected to are automatically lifted, and nobody on the outside can track who you are, read: The Internet becomes uncensored and safe again. Read our article on how to anonymize yourself and unblock any restrictions imposed on your Internet connection using a VPN. It takes about 5-15 minutes to set the whole thing up.